Alphonsus Maria de Liguori was born in 1696 near Naples, Italy, the son of a captain in the Royal Navy and a very devoted mother from a noble family in the city. His parents provided him with an exceptional education in philosophy, literature, and the arts. He was 16 when he was awarded doctorates of civil and canon law. When he was 18, like many nobles, he joined the Confraternity of Our Lady of Mercy, whose members cared for the sick at the hospital for “incurables,” washing afflicted bodies, feeding the helpless, changing bedclothes, and devoting themselves to works of mercy and compassion. Following his father’s will, he became a lawyer, and before he was 20, he was regarded as one of the most gifted lawyers in Naples. But despite his success, the work did not satisfy him at the deepest levels. After losing the most important court case he had ever taken on, Alphonsus left the legal profession to enter the priesthood, much to the disappointment of his father. He was ordained in 1726. Christ’s claim on the heart of Alphonsus was absolute and irresistible. As a young priest he worked himself to the point of exhaustion. Caring for the poor, wherever his journey took him, was the hallmark of his calling. In 1732 Alphonsus realized he could no longer be comfortable in his role of popular preacher living apart from the poor. So, leaving his family and his dearest friends, he set out to dedicate himself completely to the service of the poor and most abandoned. He sought others who were called as he was, and adopted a style of ministry to “mission among the people,” and so began the Congregation of the Most Holy Redeemer, commonly known as the Redemptorists. During a mission, a band of Redemptorist priests and brothers would come to an area to preach and conduct religious activities. They saturated the people with the sense of God. They lived in community in houses in the countryside so the mission revivals could be repeated regularly, giving the poor the assurance that they would not be abandoned by Alphonsus and his brothers. St. Alphonsus was a brilliant, articulate, pragmatic preacher. He knew how to reach ordinary people who had limited education and very real needs. They followed this gifted preacher from church to church and town to town to hear him give a message of hope in Christ for all people. Three great images, basic to the Christian faith, formed the heart of Alphonsus’ preaching and teaching: Jesus an infant in the crib, Jesus crucified on the Cross, and Jesus vibrantly alive and filled with love for all in the Eucharist. To this he added the image of Mary, the Mother of the Redeemer. When other theologians were opposed to devotion to Mary, Alphonsus invoked her, using the words of the ancient hymn Salve Regina: “Hail, Holy Queen, Mother of Mercy, our life, our sweetness, and our hope.” Alphonsus preached the redeeming love of God. He believed that law and the threat of punishment were not foremost in God’s plan. In God the Creator, love and freedom coincide. The individual was called to love God out of an overwhelming sense of gratitude for what God had done for him in Christ. It was not fear but love that was to characterize the Christian way of life. Ultimately, he wrote his most influential work, Moral Theology, to correct what he saw as errors that could hurt people struggling to live good and moral lives. In the course of his long life Alphonsus wrote more than 100 books, including his most beloved: Visits to the Blessed Sacrament, The Practice of the Love of Jesus Christ, and The Glories of Mary. He strongly encouraged his fellow Redemptorists and others to pray the rosary daily and to visit Marian shrines to foster their love for the mother of God. For him she was a constant helper and guide in all matters concerning his congregation. Although Alphonsus was sickly for much of his life, his final years were marked by very serious and debilitating physical ailments, especially arthritis, which caused him great pain and confined him to a wheelchair. He was also plagued with spiritual afflictions, scrupulously fearing he hadn’t done enough to serve the God he loved so much. To help him through these times, his confreres gathered with him to pray. They always included the Litany of Our Lady, usually followed by the rosary. They read to him from his own writings about the glory of Mary and how, as heaven’s queen, she welcomed all her true and faithful servants at the hour of their death. Early in the evening on July 31, 1787, Alphonsus made one final request. “Give me my Lady,” he whispered. They placed a picture of Mary in his hands. He spent the night in prayer with the Blessed Mother. 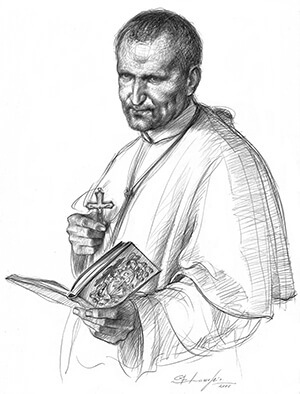 The next day at the stroke of the noon Angelus bell, Alphonsus died at the age of 91. St. Alphonsus was canonized in 1839 and declared a Doctor of the Church in 1871. He was recognized as a patron of confessors and moral theologians in 1950. Click to pray a novena to St. Alphonsus.